There’s something so voyeuristic about seeing someone else’s bathroom cabinets – I always have a look at someone’s skincare (I’m really nosy, yup) when I go to their house. I love reading the various top shelves on into the gloss so I thought it was time to share what’s currently taking pride of place on my bathroom shelf. For taking all my makeup off (done pretty much as soon as I get home) I use the Simple eye makeup remover for getting rid the bulk of my mascara – it’s cheap + cheerful but does the job without stinging my eyes. Then for my main cleanser at the moment I am loving the Nyasa cleanser – it reminds me so much of the Oskia cleansing gel but it’s a little bit richer. I normally leave this on for 5-10 minutes to let it treat the skin and it smells dreamy so it’s a nice time to just relax. After that I’m working my way through my giant personalised bottle of pixi glow tonic or using a few spritzes of the caudalie beauty elixir. At night I’m switching between the The Beauty Kitchen facial oil and the Antipodes chia and kiwi seed serum under a good layer of the Origins Night a Mins cream – together it makes my skin look and feel a lot more hydrated come morning. For any blemishes, of which I sadly have many, I love the Clinique anti-blemish solution gel – it’s potent. 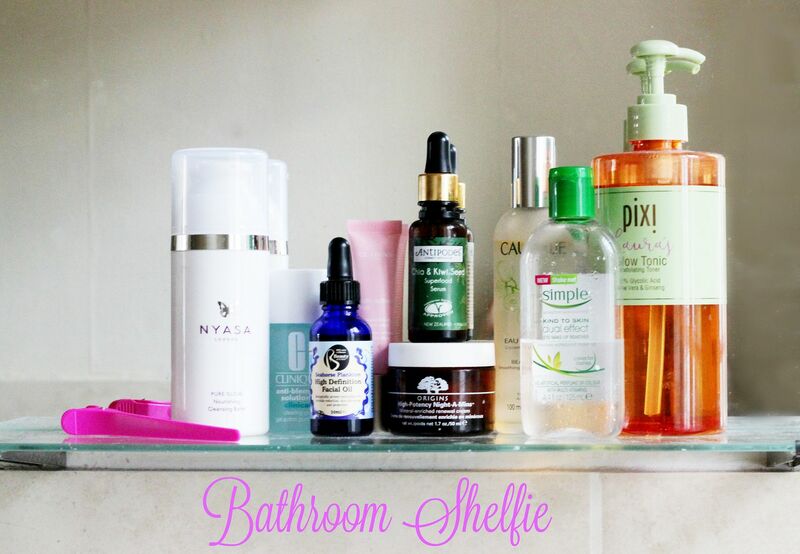 If you could see anyone’s bathroom shelfie, who would it be? I would love to see what skincare Meryl Streep uses!